Apes of Wrath is a duel minigame in Mario Party 7. Its name is a pun on the novel, The Grapes of Wrath. The opening cut scene of the game shows the two characters biting apples belonging to Ukikis in the forest. The object of this game is to avoid the Ukikis and not get caught by them. If a character is caught, that character loses and the other character that was able to escape the Ukikis chasing him or her wins. As the game goes on and no one loses, more Ukikis will appear and start chasing the characters. 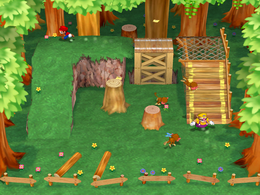 The minigame takes place in a forest, but only one little part of it can be explored. The ending shows the loser being carried off by the Ukikis. Rules – "Mmm... Delicious apples... Oh no! You stole them from the monkeys! RUN! Run for your life!" Advice – "The longer you run, the more monkeys will appear! Stupid monkeys!" If Yoshi, Birdo, or Boo are participating, they will eat the entire apple rather than just taking one bite like the other characters. If Dry Bones is participating, his head will be detached when eating the apple. If Toad or Toadette are participating, they will not lift up the apple. This page was last edited on September 15, 2017, at 07:11.